Your child’s teeth and gum development is truly a wonder. In just a little more than two decades they’ll gain and lose one set of teeth, while the subsequent permanent set will grow in coordination with other facial and oral structures. All of these structures will finally reach maturity sometime in early adulthood. Sometimes, though, obstacles can arise: disease, trauma or even genetics can derail normal development and endanger future health. So although nature does most of the heavy lifting, there are things you should do to keep your child’s dental development on track. For instance, begin oral hygiene practices before their first teeth come in. By wiping their gums after feeding with a clean damp cloth, you can help reduce the numbers of disease-causing bacteria in the mouth. Once teeth appear switch to brushing. There are also habits to avoid. Don’t kiss your baby directly on the lips—you may transfer to them your own mouth bacteria, which their young immune system can’t yet adequately handle. Also, avoid putting them to bed with a sleep-time bottle filled with sugary fluids (including milk or formula) because the constant contact between the sugar and their teeth could increase their risk for tooth decay, the number one dental disease in young children. Of course, not all prevention efforts depend on you alone—we’re your partner in helping to keep your child’s dental development progressing normally. We can provide preventive treatments like sealants or topical fluoride to reduce the risk of tooth decay, while continually monitoring for signs of the disease that may require treatment. We also look for signs of emerging bite problems that may require intervention before their effects worsen. This is all part of regular dental visits, usually at six-month intervals, which are best begun around your child’s first birthday. 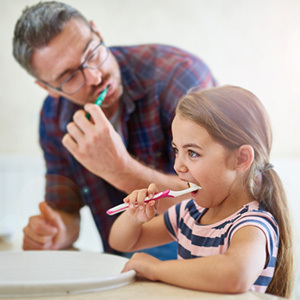 Not only does this enable us to stay ahead of dental problems, it also helps your child become more comfortable with dental visits and increase the likelihood they’ll continue the habit in adulthood. As we said, nature is responsible for most of this amazing development without any help from us. But we can assist development and hopefully prevent issues that could diminish their dental health in years to come. If you would like more information on supporting your child’s dental development, please contact us or schedule an appointment for a consultation.